In 2000, Borge Bakken argued that China has “never been a ‘police state’ if we define that term as the number of police per population”. Based on data from 1992, Bakken noted that China’s per capita police count stood at only half of the world average. Most rural areas did not have a single police officer. In regards to China’s far western region of Xinjiang, defence expert Yitzhak Shichor wrote in 2004 that Chinese security forces were “quantitatively and qualitatively inadequate to cope with emergencies.” A surprising assessment, considering that after the September 11, 2001, terror attack on the World Trade Centre, China had launched its own “war on terror” against Uyghur Muslim separatism in Xinjiang. During the July 2009 Urumqi riots, however, the state was forced to scramble commercial aeroplanes to fly in security forces from all over China in order to prevent the unrest from spinning out of control. By late 2017, Xinjiang has become perhaps the most heavily policed region on the planet, with estimated per capita police counts exceeding the record-setting level of former East Germany just before that nation’s fall in 1989. Simultaneously, it has installed one of the world’s most sophisticated high-tech surveillance systems, and now outspends most Eastern Chinese provinces on information technology investment on a per capita basis. How did this come about? 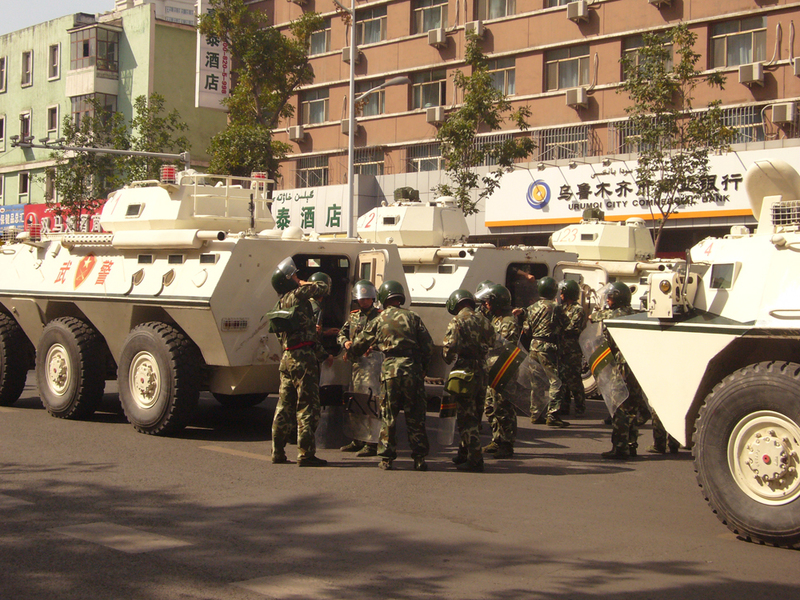 After violent protests in Tibet’s Lhasa (2008) and Xinjiang’s Urumqi (2009), the state responded by boosting local police capacity. Traditionally, social unrest has been squashed by the People’s Armed Police, Beijing’s premier domestic security force. However, leaders soon realised that while these heavily armed forces garrisoned outside community boundaries are suited to stomp out the fires of unrest, they cannot replace a strong community-based police force that is sensitive to early signs of imminent trouble. Gradually, the state began to adjust its security strategy from passive response to pro-active prediction. In 2008 and 2009, Tibet and Xinjiang’s initial response was to double and triple their advertised annual police intakes. In particular, both regions created special police units that are trained to respond to terrorist incidents and other demanding situations. But the full extent of Beijing’s securitization effort in these restive regions emerged with the advent of Chen Quanguo, a soldier-turned-politician from Henan province. After becoming Tibet’s Party Secretary in 2011, Chen unleashed an unprecedented and multi-pronged security drive, consisting of the establishment of nearly a thousand community-based “convenience police stations“, the installation of a sophisticated high-tech surveillance system, and thousands of new police jobs. Between 2011 and 2013, Tibet advertised four times as many police positions as from 2007 to 2009. In Lhasa, Tibet’s capital, locals joke that the city is safe because “all the criminals got police jobs”. In most cities in Xinjiang and Tibet, digitally networked convenience police stations can now be found every 200-300 metres. Major public transport hubs and intersections feature airport-style full-body scanners and security gates where ID card scans are verified through advanced facial recognition technology. In 2016, after having successfully suppressed dissent in Tibet, Chen Quanguo was transferred to Xinjiang. Ever since the launch of Xi Jinping’s signature Belt and Road Initiative, social stability in this region had become a top priority for Beijing. Immediately, Chen unleashed what is likely the greatest police recruitment drive in China’s recent history. During his first 12 months in office, Xinjiang advertised over 100,000 security-related positions, 13 times more than in 2009, the year of the Urumqi riots; and 32 times more than from 2003 to 2006 combined. Most of these jobs were for contract-based assistant police forces (xiejing), an informal type of police that has become popular throughout China as a flexible and typically cheaper means for boosting policing capabilities. Between January and September 2017, Fujian and Guangdong provinces, with a combined population of 146 million, advertised about 11,000 assistant police jobs, while Xinjiang sought to recruit 70,000. Per capita, Xinjiang’s figure was 40 times higher. The massive police intakes orchestrated under Chen Quanguo’s governance illustrate that the state’s security strategy does not rely on technology alone. Rather, we are witnessing a sophisticated, multi-pronged strategy that operates on several levels. At the top end, high tech server farms perform big data collection and analysis, aided by artificial intelligence (AI) algorithms. At the bottom end, low-educated assistant police forces man checkpoints, patrol neighbourhoods, perform searches and scan mobile phones for illegal contents. Any behavioural deviance quickly results in detainment in political re-education camps. With progressive societal digitalisation, a troubling shift from post-incident response to surveillance-induced anticipatory compliance is taking place. In all this, an increasing cross-fertilisation between heavily policed western minority regions and the economically developed east is evident. By 2017, China featured the world’s largest monitoring network with an estimated 176 million CCTV cameras and plans to install 626 million by 2020. Huawei’s “Peaceful City” system can store 100 Petabytes of surveillance video and other data – roughly equivalent to 50 trillion pages of text. According to a recent research report, in 2015 China submitted nearly twice as many AI patents as the next two nations (USA and Japan) combined. Xinjiang, with its tense security environment, is then the perfect location for companies to test and optimise their security products in real-usage contexts before exporting them worldwide. According to Xinjiang’s recent government work report, heavy-handed securitization measures are set to become an institutionalized and normalized part of life for years to come. Chen Quanguo himself just called on all security forces to “continue to maintain a strike-hard governance of high-pressure deterrence”. Meanwhile, we can speculate based on various sources that up to 5 percent of the adult Uyghur population in Urumqi and southern Xinjiang has been or is currently detained in extralegal political re-education camps. The potentially disastrous ramifications of China’s securitization drive in Tibet and especially Xinjiang are difficult to fully assess at the present. One thing, however, is beyond doubt: the all-knowing digital police state of the 21st century is being perfected in front of our very eyes. Dr Adrian Zenz lead development work in China before pursuing his PhD research, which focused on Tibetan minority education and tertiary graduate employment of Tibetans in China. He is currently engaged in researching minority language requirements in government recruitment in China’s Tibetan areas and Xinjiang, focusing especially on the recruitment of security-related personnel and minority teacher recruitment. He is academic co-editor of the Mapping Amdo series of the Amdo Tibetan Research Network. Image Credit: CC by Andrew An/Flickr.